Game 24: San Diego Padres hand Dodgers fifth loss in a row. Matt Kemp was the center of attention at Dodger Stadium, getting the last laugh in the Dodgers’ fifth straight loss. The game story is here. The box score is here. Kenley Jansen had a strong reaction to former teammate Dee Gordon‘s 80-game PED suspension. 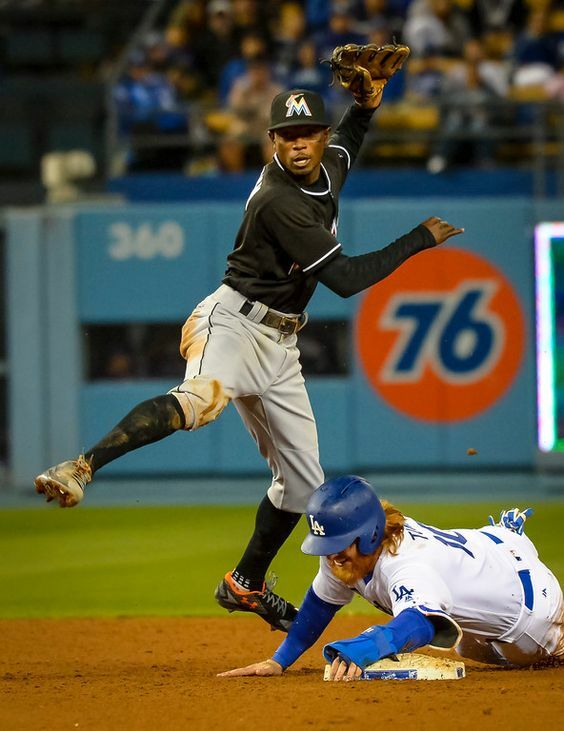 Game 23: Dee Gordon is suspended after helping Marlins sweep Dodgers. How’s this for a strange night at the ballpark: Former Dodger Dee Gordon delivered the game-winning hit Thursday, ensuring a four-game sweep by the Miami Marlins, then was suspended 80 games for performance enhancing drug use minutes after the game. The Dodgers’ outfielders are taking advantage of analytics and NFL-style meetings. Zack Greinke wins second consecutive National League Gold Glove Award. Dodgers pitcher Zack Greinke won the National League Gold Glove Award for the second straight year. Greinke was chosen for the award ahead of Jake Arrieta and Gerrit Cole. Adrian Gonzalez was a finalist, but Arizona Diamondbacks first baseman Paul Goldschmidt won the NL Gold Glove Award for the second time in his career. One other player on the Dodgers’ payroll won a Gold Glove today: Miami Marlins second baseman Dee Gordon. The Dodgers agreed to pay Gordon’s 2015 salary ($2.5 million) when they traded him to the Marlins last winter in a three-team deal that helped them acquire Howie Kendrick, Chris Hatcher, Enrique Hernandez and Austin Barnes. Gordon also led the National League in batting average (.333). Game 89: Save your congratulations for Brandon Beachy. 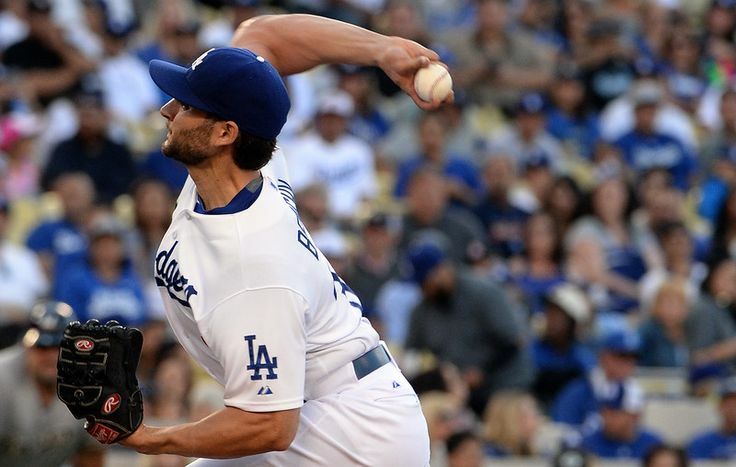 It would be really, really easy to congratulate Brandon Beachy for simply making it back to pitch in a major-league game Saturday, but he wasn’t in the mood after the Dodgers lost 7-1 to the Milwaukee Brewers. The photo gallery is here. The box score is here. Before the game, Dodgers first base coach Davey Lopes cringed to learn about the head-first slide that knocked Dee Gordon out of the All-Star Game. All-Star voting update: Adrian Gonzalez leads all National League first basemen. The Dodgers’ Adrian Gonzalez leads all National League first basemen in All-Star balloting. Gonzalez has 929,016 votes as of this morning. Chicago Cubs first baseman Anthony Rizzo is second, with 489,255. Gonzalez leads all qualifying MLB first basemen in batting average (.348), slugging percentage (.646) and OPS (1.071). His 35 RBIs are second only to Paul Goldschmidt of Arizona. If he wins the fan vote, he’ll be the first Dodgers first baseman to do so since Steve Garvey (1974-80). MLB only releases the top five vote-getters at every position, except the outfield. Only second baseman Howie Kendrick (third), and outfielders Joc Pederson (sixth) and Yasiel Puig (13th) showed up on Wednesday’s list of leading vote-getters. Kendrick (385,427) trails former Dodgers second baseman Dee Gordon (934,249) and St. Louis’ Kolten Wong (582,238).